Hannah Greely, The Picnic (2017). PVC, cardboard, canvas, chicken wire, velcro, aqua resin, fiberglass, hydrostone, gesso and tempera, 42 × 42 × 55 inches. Image courtesy of the artist and Parker Gallery, Los Angeles. 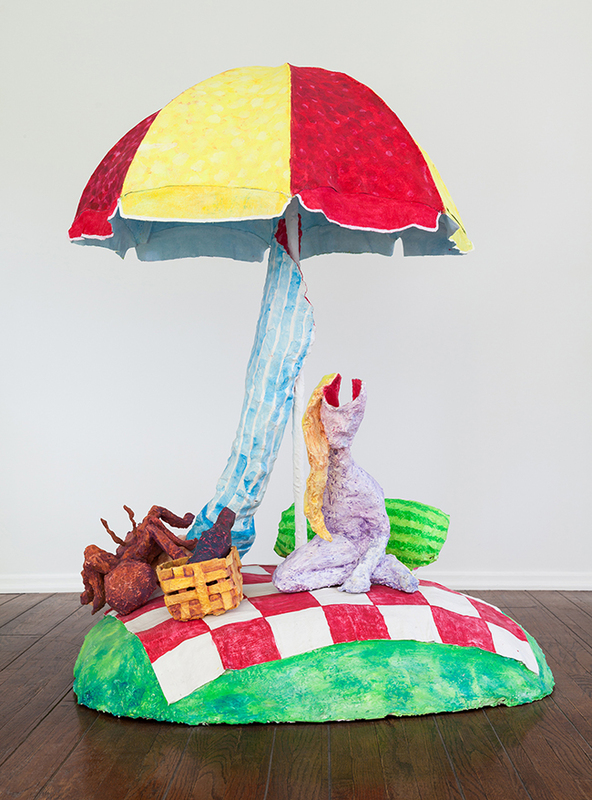 Upon entering Parker Gallery, set in an Old Hollywood-style mansion at the base of Griffith Park, the first thing that caught one’s eye was Hannah Greely’s A Leg to Stand On (all works 2017). 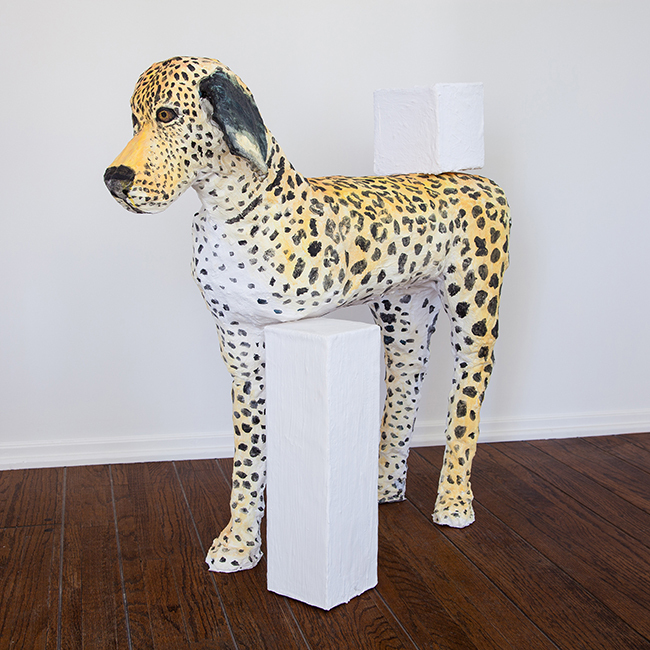 The artist positioned a cheetah print doggie in the foyer, next to the staircase; its front left leg is amputated, its nub propped on a short and skinny white plinth. The canine looked forward towards the ground—bored, cynical, embarrassed, jaded? Perhaps an alternative title could have been A Dog to Stand In? The humbled hound, still standing and pointing ahead: a metaphor for the majority? Greely put out a complex kitschy vibe that began with this somewhat stewing watch guard and permeated throughout the house, seductive at first, then cautionary. In the room to the right sat The Picnic, an isolated scene of romance and trauma. An oversized male arm descends from beneath a beach umbrella; his hand rests beside a forlorn, lobotomized blonde looking away from the giant man’s reach. A spider sidesteps a basket on the blanketed lawn and goes after the intruder. The peculiar combination of materials ranges from the industrial (PVC, Aqua-Resin, fiberglass) to the crafty (chicken wire, Velcro, and tempera). This setting could have be read as the lamentation of a ruined relationship; yet the contemporary Me Too and Time’s Up movements add extra layers of pain to the portrayal. Nearby was L-O-V-E, a sweet and wonky clan of animated denim-clad letters, stuffed with doodad organs, holding each other’s hands and spelling out the work’s title. One could assume that this grouping is a nuclear family. But they could easily be three friends or even in a polyamorous relationship, as depicted by a spirited and unruly maker. It is a tired art-historical trope to channel one’s inner-child, but this work did not feel satirical or sanctimonious like so many other youth-inspired gimmicks do. Instead, the jankily-molded chained gang felt authentically innocent and alien. William T. Wiley, Movement to Black Ball Violence (Homage to Martin Luther King) (1968). Black friction tape, wooden stool, gold leaf, rubber tricycle tires, carved wood log by H.C. Westermann, paper and tape on board, linoleum flooring, 50 × 24 × 24 inches. Image courtesy of the artist and Parker Gallery, Los Angeles. Upstairs was a concise yet cohesive collection of the work of William T. Wiley. Anchoring the intimate exhibition was Movement to Black Ball Violence (Homage to Martin Luther King) (1968). The piece is composed of a gold-leafed rubber tricycle tire resting atop a large ball consisting of black friction tape—the head of a dark-skinned angel—perched on a wooden stool. 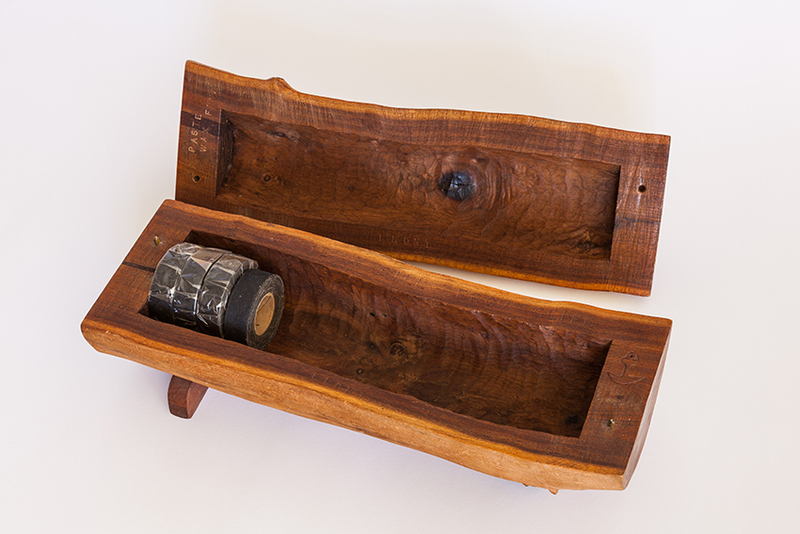 A typed and signed note leans against the stool; in it, Wiley explains that the objective of the piece is for viewers to add black friction tape to the black ball, or to hire those in need of work to do so, until the anniversary of Dr. King’s death. Upon the anniversary, Wiley would donate the results to “an appropriate person or place.” At some point, an amendment had been made: The ball would be added to until it “achieves the proper proportions.” There was no way of telling what the proportions looked like in years past, but they appeared to be quite proper here. As for an appropriate place? An open bedroom in a domestic gallery, accessible to the public, is a pretty good fit for now. On the walls hung four paintings: Pre-Tsunami Abstraction with Migraines (2011), Angry Angels (2017), Pay Gun Totems Black Ball (2017), and Cosmic’s Cull (2017). Wiley has been known to deploy a wily use of language, and it is in effect within the titling of these wall works, bonded by a black-and- white actionist aesthetic. One work contains a portion of a pyramid splitting the picture’s composition in half, with the phrase “So The Missing Corner / The Kissing Mourner” floating freely. These words harkened back to the romance and trauma of Greely’s The Picnic on the ground floor, but with less spunky explicitness; rather, they projected more of a sullen resilience. In each room downstairs, Greely demonstrated a self-assured commitment to remaining a wild child amid the rapid flow of tepid trends. She has a patience that often seems lost among many trying to make it in today’s world. On the floor above, Wiley—over twice her age—flaunted an admirable attempt at preserving a whimsical practicality while also trying to hold on to the heaviness of the world. There is an arguable futility to this sort of act, which is likely why so few (in either generation) are willing to make the effort. 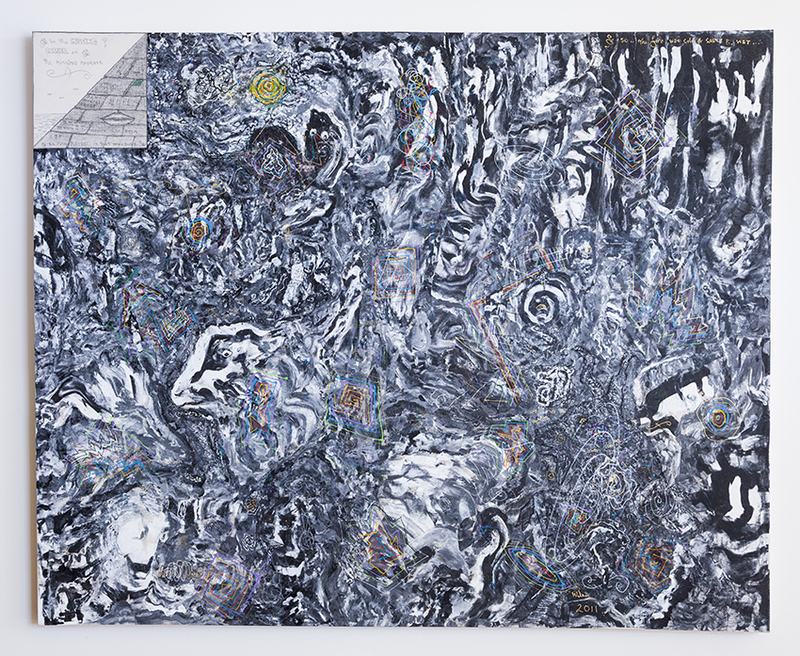 Yet, despite the gap in age and aesthetics, both artists address the social and political with a dark witticism and intense vigor, with Greely couching her concerns in playfully subversive visual language and Wiley taking a more sobering approach. These artists each exude a wonderfully unconventional wisdom; and for its part, the gallery did the same by pairing an exuberant talent with a venerable and vulnerable pedagogue. Hannah Greely, A Leg To Stand On (2017). PVC, cardboard, chicken wire, aqua resin, fiberglass, hydrostone and tempera, 48 × 12 × 34 inches. Image courtesy of the artist and Parker Gallery, Los Angeles. William T. Wiley, First Stage of Infinity (1971). Wood, leather and twisted branches, with watercolor and ink on paper, Stage: 22 × 23 1/2 × 3 3/4 inches, Infinity: 38 × 12 × 5 inches, Watercolor: 30 × 22 inches. Image courtesy of the artist and Parker Gallery, Los Angeles. 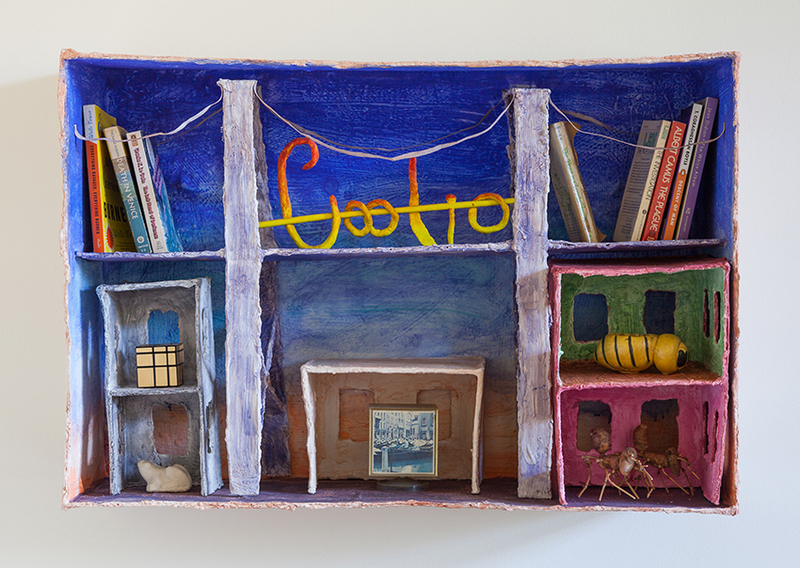 Hannah Greely, City Bits (2017). Cardboard, aqua resin, fiberglass, hydrostone, tempera and personal effects, 35 × 23 1/2 × 12 1/4 inches. Image courtesy of the artist and Parker Gallery, Los Angeles. Hannah Greely, Keeper (2017). PVC, canvas, chicken wire, velcro, aquaresin, fiberglass, hydrostone, gesso and tempera, 60 × 46 × 46 inches. Image courtesy of the artist and Parker Gallery, Los Angeles. William T. Wiley, Pre-Tsunami Abstraction with Migraines (2011). Acrylic and charcoal on canvas, 62 × 77 1/2 inches. Image courtesy of the artist and Parker Gallery, Los Angeles. William T. Wiley, Movement to Black Ball Violence (Homage to Martin Luther King), (1968) (detail). Black friction tape, wooden stool, gold leaf, rubber tricycle tires, carved wood log by H.C. Westermann, paper and tape on board, linoleum flooring, 50 × 24 × 24 inches. Image courtesy of the artist and Parker Gallery, Los Angeles. 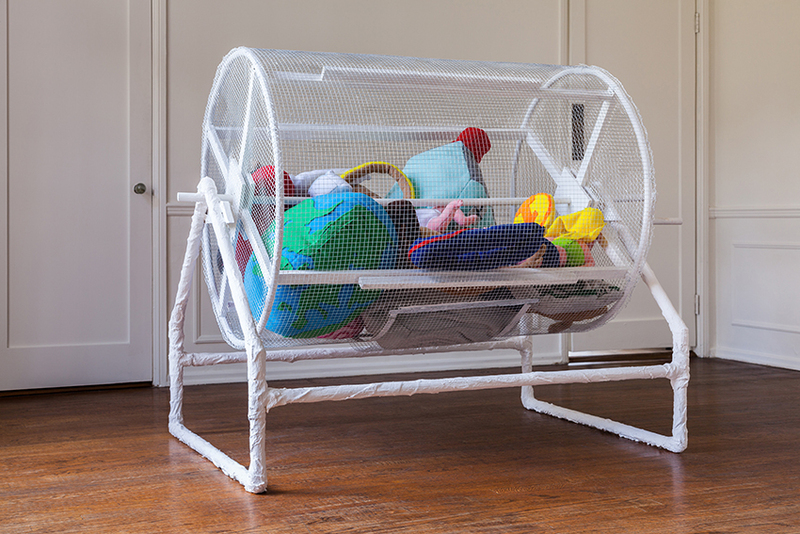 Hannah Greely, Life Raffle (Big Sweet Dreams) (2017). 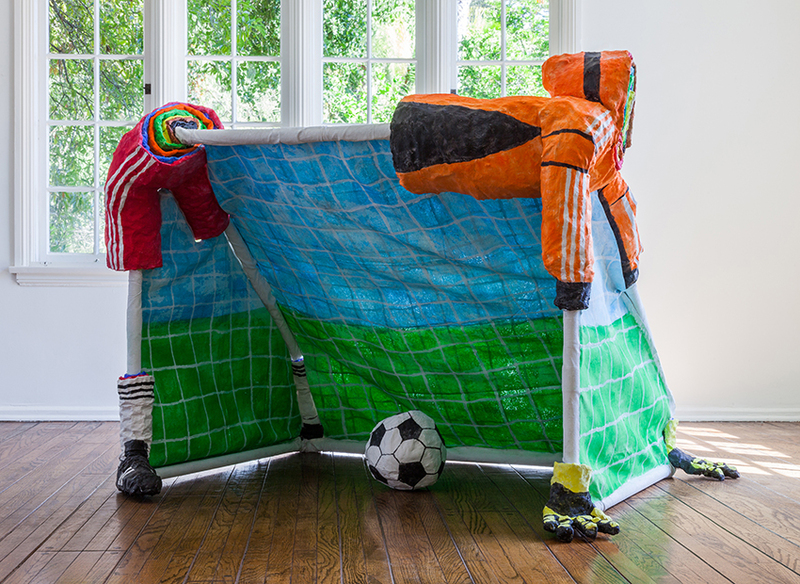 PVC, wire, wood, aqua resin, fiberglass, hydrostone, gesso, fleece and polyester fill, 72 × 39 × 50 inches. 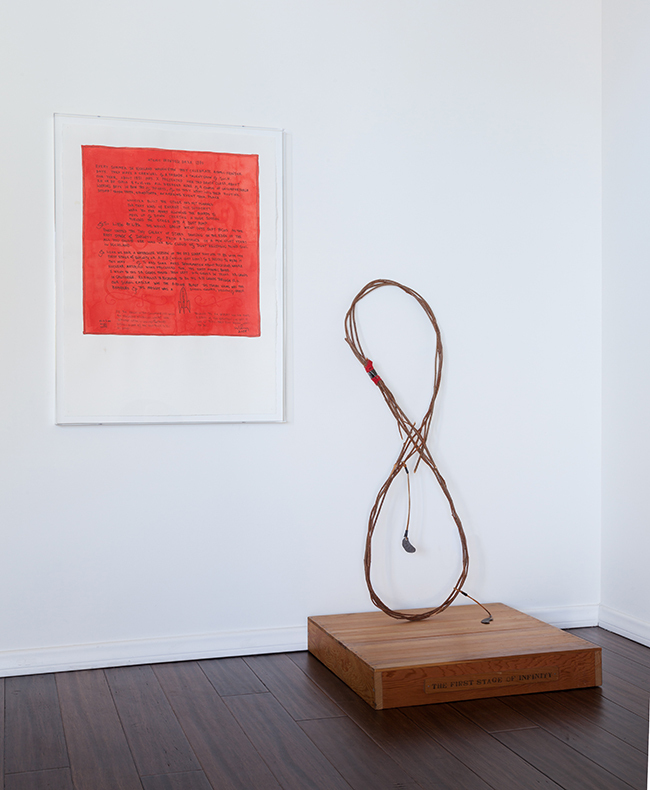 Image courtesy of the artist and Parker Gallery, Los Angeles.